"Both of my parents were artistic, so painting and drawing were a part of my family life from an early age. Thus, love for the arts was encouraged and fertilized throughout my adolescence. After graduating high school I traveled to Europe to study the great master works. While in Europe I was deeply influenced by the works of Michelangelo, Brancusi, Giocometti, Picasso and others. While living and studying abroad I apprenticed with an Italian master on a monumental bronze sculpture of the crucifixion for a piazza in suburban Rome. After returning to the United States in 1975 I met and married my wife, Marsha, who was also an artist. We began working collaboratively on a series of sculptural works. The first showings of these personal and unique sculptures were exhibited in 1980 and 1981. National exhibits soon followed, and through those opportunities we obtained numerous site specific commissions. Since that time, we have been full time artists producing works together and independently in many different mediums. We returned to Europe in 1987 to revisit works of the masters and establish exhibits. 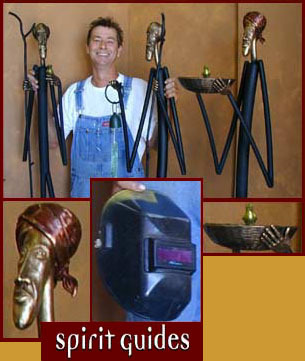 During this period I also spent time in Africa exploring my interests in primitive sculpture. To this day, that trip to Africa continues to influence and infuse my work. Today, in addition to the Spirit Guides, I produce independent one of a kind sculpture and create commissioned artwork for both the public and private sector. Some of this work may be accessed by a link within this site. I would like to thank so many people who have helped me with this project. First to my wife, Marsha, who is my best friend too, I love you. To Eric and Toby who put up this really wonderful site, way cool. Dave Brooks of Brooks Photo took all the great pictures, thanks. Additional thanks to Cam, Alan and the crew, Steve, Kevin and Fluvio."